Diskeeper is an institution in the defragmentation software arena. It was the first defragmentation software that I ran into many years ago and it continues to live up to expectations. Like everything Executive Software produces, Diskeeper is an excellent software utility that does what it says it is going to do, plus a little bit more. When you run Diskeeper, you'll see a screen with two panes. The top pane lists all of your drives that are available for defragmentation. The bottom pane looks like a spreadsheet without the vertical lines-this is the details pane. From here defragmenting your disk is simple. Just right-click the drive and select Defragment. Figure 1 shows the results. To schedule defragmentation you highlight the drive and, from the Action menu, select the Set It and Forget It menu; then, choose Disk Volume Scheduler. 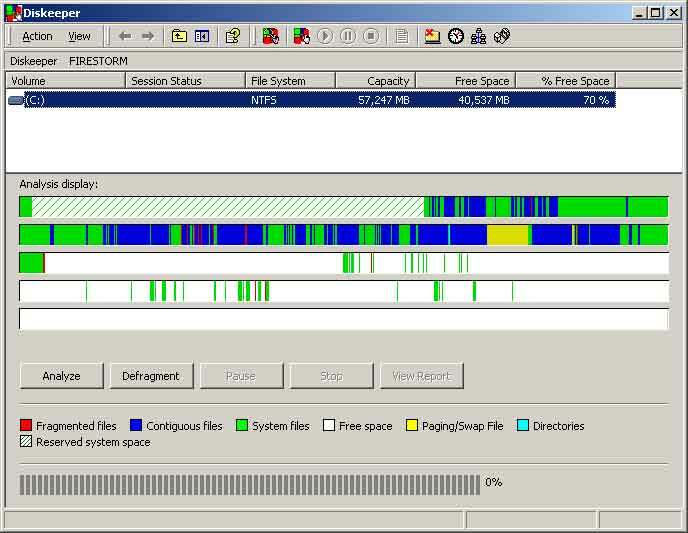 You can manually select the times you want the defragmentation process to run or you can choose Smart Scheduling, an innovative technique that allows Diskeeper to figure out just how often your disks need defragmenting. You can also schedule Boot Time defragmentation, which will defragment your system files (paging, MFT, directory consolidation). You can even control the priority that the process runs in by selecting Priority from the Action menu. Another useful feature is Frag Guard, which runs as a service in the background to keep your system files defragmented at all times. 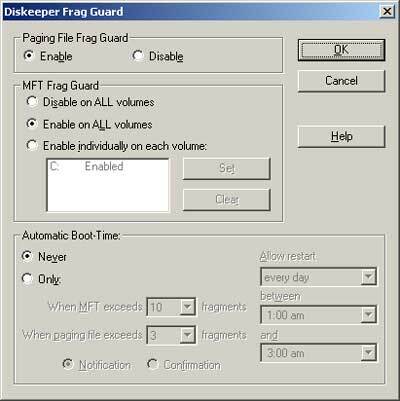 Every time you write to the disk, Frag Guard will try to keep your MFT and paging files contiguous. To turn on this feature, just select Frag Guard from the Action menu and then enable it for the paging file and any volumes where you want to keep the master file tables defragmented (Figure 2). Figure 2. Setting up Frag Guard. I only ran into two problems. First, when I enabled Frag Guard, I noticed a small performance hit. It was well within acceptable levels but I did notice it. The second issue has been around for a while: Diskeeper is not as thorough as you might expect. Every time I ran Diskeeper, I had 11 fragmented files left over. I would have expected the software to defragment these files because they were not in use and they were not system files. No matter how many times I ran the process, the files remained fragmented. I have seen this behavior on other systems as well. The drive still gets sufficiently cleaned, though. All things considered, this is a great piece of software. If you're in the market for a new defragmentation package, then you definitely need to consider Diskeeper.